mellchie | Maker, scientist, glider pilot and most importantly: unique. Maker, scientist, glider pilot and most importantly: unique. I’m involved in a big not-hackspace project at the moment, meaning I’ve not been up to much recently. 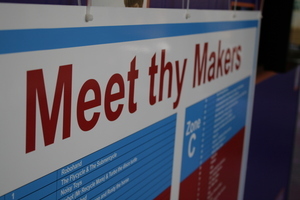 However, I was foresighted enough (many weeks ago) to sign up to go to Maker Faire UK 2014 in Newcastle as part of the Nottinghack collective. 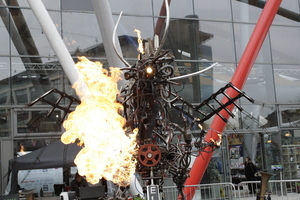 Maker Faire UK was hosted by the Centre for Life in Newcastle, Saturday and Sunday 26th/27th April. It’s now the Tuesday afterwards and the memories are still almost as exiting as the real thing! 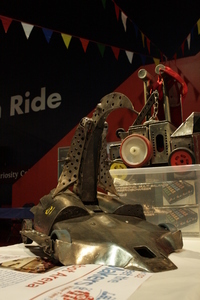 I’ve had a quick look in the media for reports and stories and whilst the outside attractions got plenty of coverage (although admittedly GIANT CAR-CRUSHING ROBOHAND!) I’ve not seen much of the inside stuff – which although smaller in size, was equally amazing. 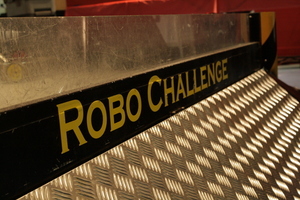 So here are a few of the things I thought were awesome: I used to spend every Friday night between the ages of 8 and 12 watching Robot Wars and wishing I could have a go. Well, more than a decade later, I had the chance! Four mini-bots in a 10-foot square arena with no fire, spinning blades or house robots is a little tamer, but there were a couple of full-size robots on display (and I got to carry one!) 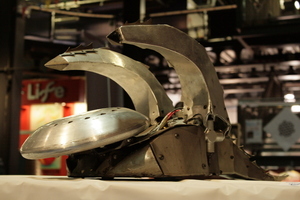 Venom, not unlike Razor – probably my favourite house robot! 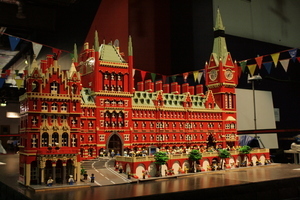 An incredibly detailed Lego model of St Pancras station took centre stage… … complete with a bovine passenger! 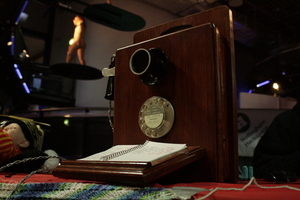 Nottinghack made a good show, featuring Mouse’s Dial-a-Thing (incredibly popular! 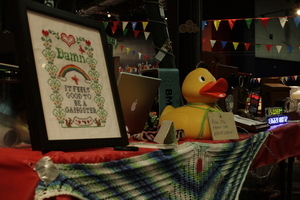 )… …Ein the duck is ready to welcome the hoards of curious visitors… There were some incredibly colourful and intricate 3D-printed items on display upstairs with Shapeways… …and intricate laser-cut marquetry pieces on Just add Shark’s table. 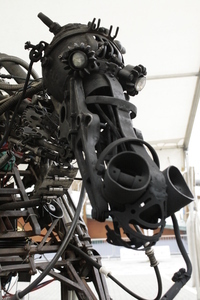 Returning for another year were Rusty the horse and Elsie Dragon… …and the largest puppet I’ve ever seen (Binbot) went for a walk outside! There was so much stuff I’ve barely scratched the surface. I had a fantastic time, met some great people and came away with some memories I’ll not forget in a long time! This entry was posted in Uncategorized on April 29, 2014 by mellchie. A while ago I purchased a lovely pair of Clarks shoes in a very pale blue. I used them a lot whilst working one summer and they were great, until, one day, I got caught in a downpour. The pourous leather soaked the water up like a sponge and it took the dye with it. I don’t have any pictures, unfortunately, but the leather had become discoloured and a slightly less charming grey. 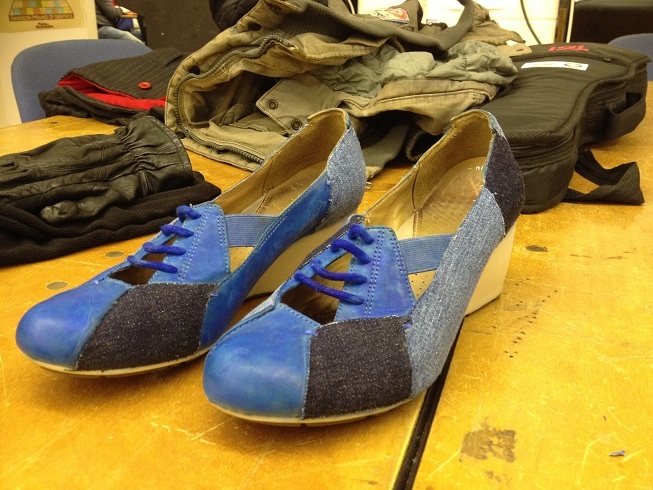 I hate throwing things away and I knew that no charity shop would accept my shoes in their current state, so I decided I would do something about it – there was nothing wrong with them that wasn’t cosmetic. Like a number of my “projects”, this was put to one side and left for a while. I was having a clear-out one afternoon and found the shoes. 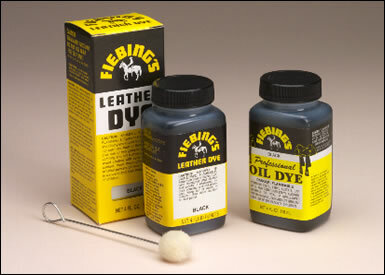 Searching the internet identified a range of leather dyes and a couple of hours later I had decided I was going to purchase a bottle of Fiebings dye and attempt to turn the leather into a mid-blue. 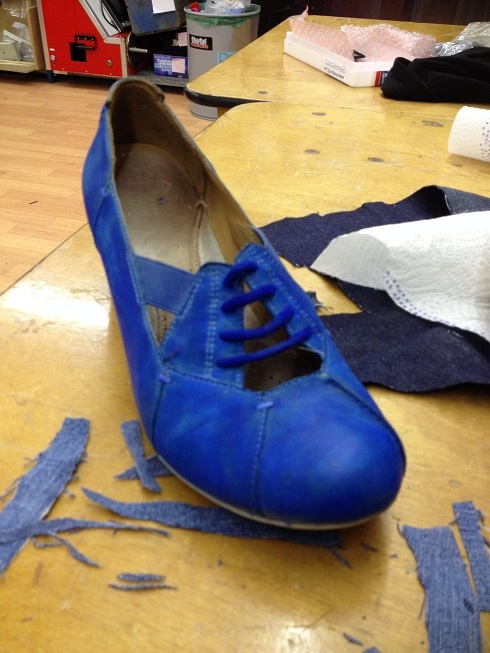 I had slightly underestimated the vividness of the dye and the leather turned out very blue! Being of the (initially) shy sort, I didn’t feel brave enough to wear these outright, but most importantly, the dye didn’t conceal the worst of the watermarks as I’d hoped – it made them worse in some places! I dug some old denim scraps out of a box at Nottinghack – I had previously donated a small amount of old denim in the form of a couple of pairs of jeans. I have no idea where, or from whom, this idea arose (something on the internet a long time ago I suspect) but I decided the way to go was to cover the more stained sections with denim. The shoes weren’t ever going to be water-resistant, so it didn’t matter too much which glue I used, so I grabbed a bottle of PVA and some small scissors from the workshop. 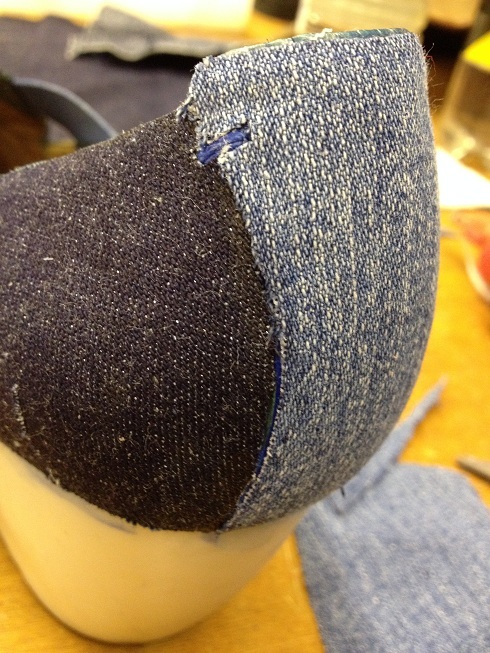 I applied a good layer of PVA to each section and cut a piece of denim larger than what I needed. 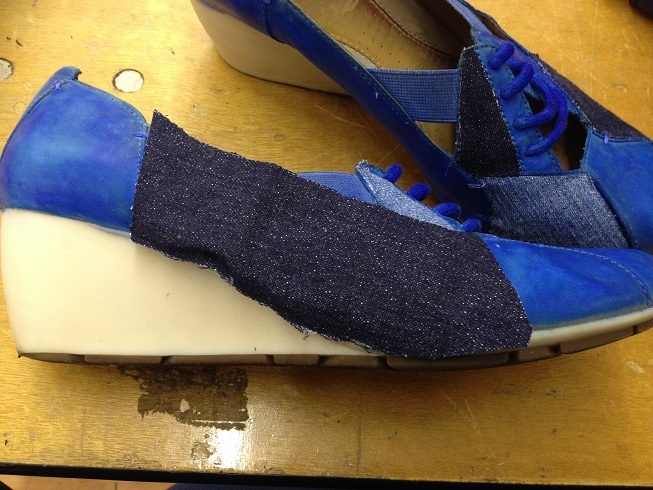 I had played about with cutting templates from paper, but soon discovered it was easier to shape the denim once it was attached to the shoe. 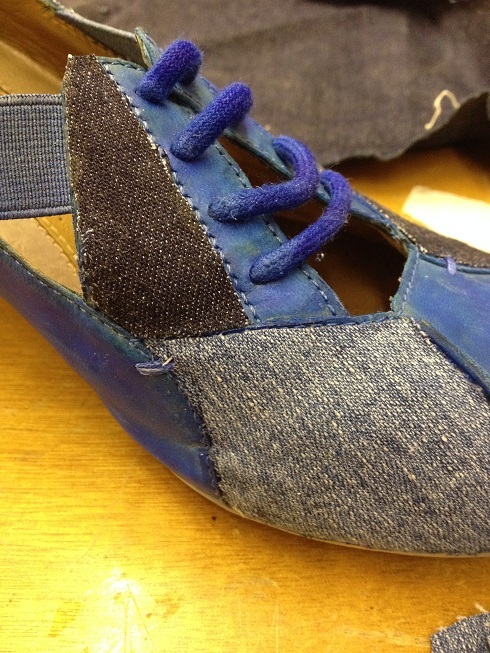 It was just a case of applying scraps of denim in turn and carefully cutting around any “features” – the design of the shoe included some attractive stitches. I also tried to carefully align the weave of the fabric so that the grain was placed as attractively (and consistently) as possible. It was also tricky to find the right colour of denim – one of the pairs of trousers had been stonewashed and keeping the colour consistent was tricky. I also tried to dab glue along the edges of the fabric to reduce any fraying that might occur with use. And that’s it! An asymmetric design, accomplished in one evening. I can also report that the shoes wear no differently to before and are as comfortable as ever! This entry was posted in Uncategorized on March 16, 2014 by mellchie. 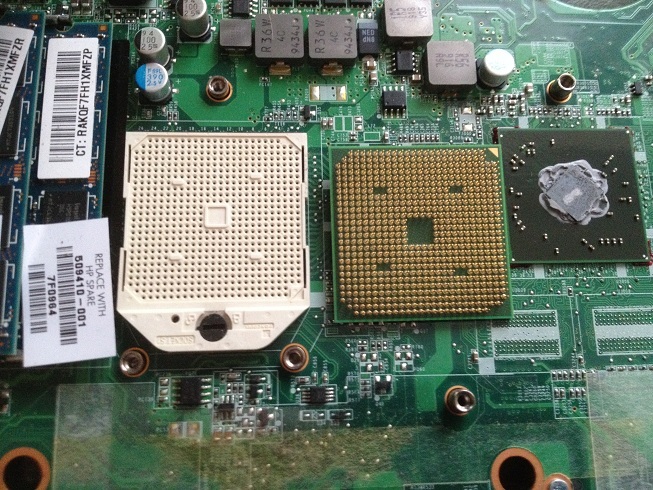 For a while now my trusty laptop (HP Pavilion DV7) had occasionally been reluctant to start up – the fan would fire up, the optical drive would whir and beep and the LEDs on the NUM lock and CAPS lock would flash. Then flash again. And again. The screen wouldn’t light up; no welcoming Windows logo. My temporary fix was to power off, remove the power cable/battery and hold the power button down for between 15-30 seconds. Replacing the battery I could usually be sure of a successful start-up. This went on for about a year – until around 2 weeks ago. My dodgy fix no longer worked. A brief search on the interwebs took me to the HP website, which contained a useful table detailing the “blank screen error codes”. This indicated that a fault lay with the CPU. 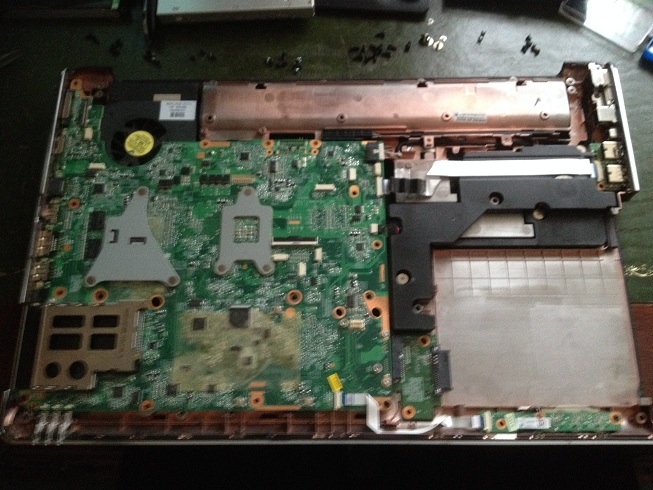 Now, I’m not really that clued up on laptop hardware (despite having previously replaced the keyboard after a spilt-coffee incident) and after identifying where the CPU actually was, the idea of completely dissembling the laptop, possibly irreparably, wasn’t particularly attractive. Neither was a trip to the laptop repair shop, who may not have been able to do anything – one piece of information I hadn’t been able to ascertain was whether the CPU was soldered in place or held in by a clamp. Now, the last option isn’t really an option as I don’t have the disposable income. To be honest, I couldn’t really afford to take it to a repair shop, either. 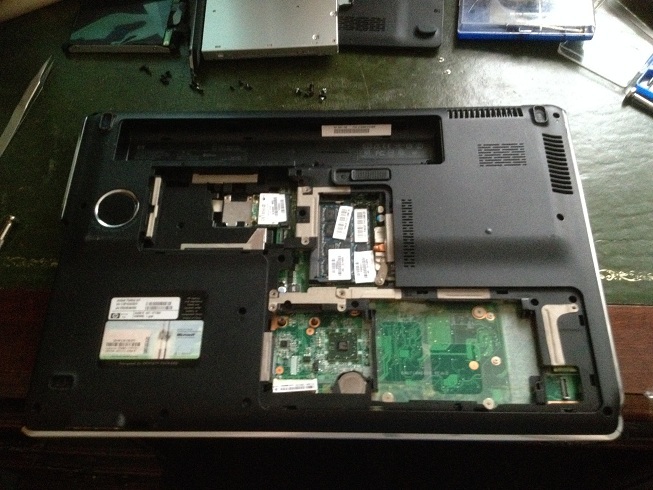 Another internet search identified lots and lots of laptop disassembly tutorials and videos. It didn’t look too hard and you don’t need any tools more special than a mini screwdriver. So all I needed was a free day. Two weeks after my laptop “died” I had a free day. So, feeling not a little nervous, I placed it on my desk. One last push of the power button; no blue windows screen. This was it. 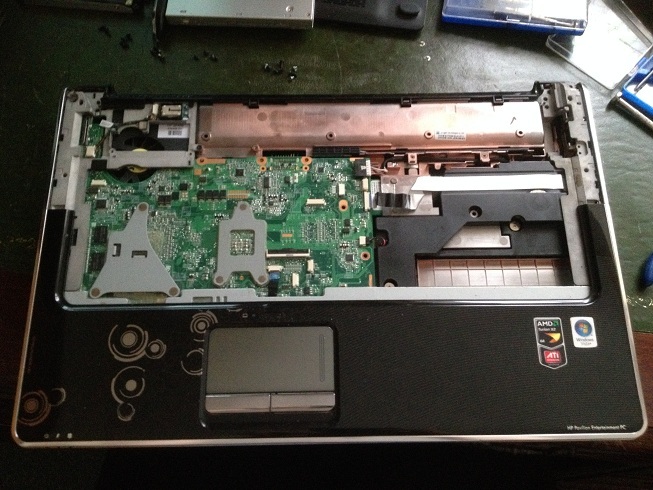 Out came the battery, the hard drive and wireless card; surgery began! My prize – the motherboard! Just over an hour and a significant number of tiny screws later, I was sat looking at the motherboard and an (organised) heap of parts. Thankfully, the CPU was held on with a clip; I knew that if I reassembled the laptop and it still didn’t work I could try replacing it. Whilst I had the motherboard out, I decided it might be a good idea to check exactly how clogged-up the fan was, as I could see a strand of hair had wrapped itself around the hub and wasn’t coming off without a fight. 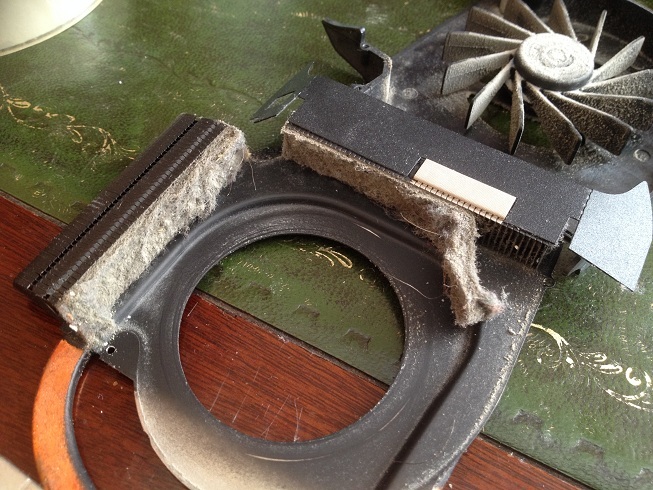 A good idea, too – the dust had built up and was 5-6mm thick on the heat sinks! 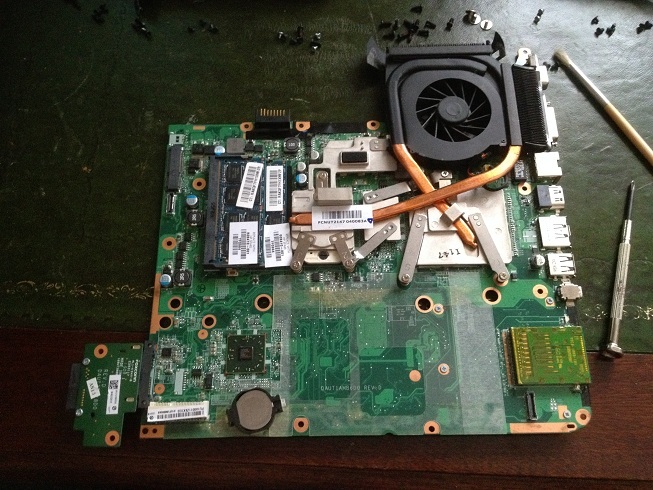 Having brushed the fan and heat sinks clean, I resat the CPU, bemoaned the fact I had no thermal grease to refresh the well-and-truly dried-out original and reassembled the laptop. On a whim, I pressed the power button. The optical drive whirred and beeped, the LED’s flashed… and the screen lit up! The windows logo appeared! It lived! A stray thought struck me… the fan was awfully quiet… In fact, it wasn’t turning at all. I thought back. Surely removing the fluff can’t have made THAT much of a difference… Oh. I’d forgotten to plug the fan back onto the motherboard. 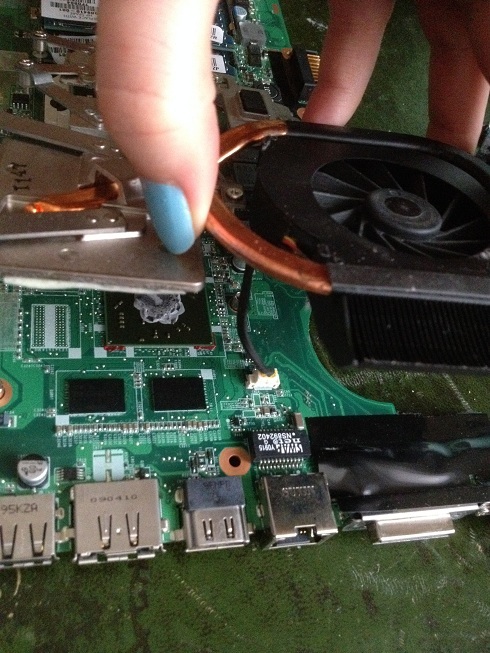 That particular plug was underneath the fan, meaning I’d have to completely dissemble the laptop again. Oh well. At least I’d get some practise! 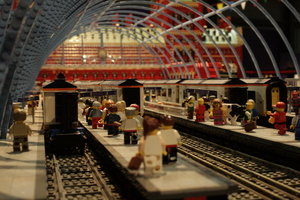 This entry was posted in Electronics on March 16, 2014 by mellchie. I’ve been getting bored recently. After graduating I spent the summer working for a lettings agent who were particularly busy with the annual tide of students departing and arriving. It was nice being lent a car and driving around the local area, as I’ve learnt a lot of routes and seen places that I would otherwise have had no reason to go to. Anyway, that finished a couple of weeks ago and whilst the job kept me physically occupied, my head was relatively underused and as a result I’ve been rather bored. To top it off, my old Uni login no longer works so I can’t occasionally access research papers out of nostalgia (open access excepted, of course). 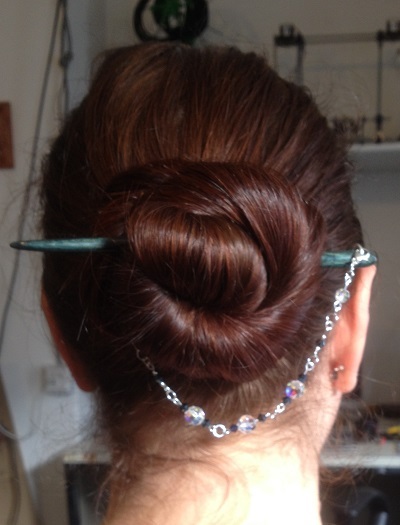 I started looking around on the internet for attractive or unusual hairsticks, as I quickly discovered that holding my fairly long hair in a bun is quite difficult using only pins and a hair band. Also, I’m going to look daft enough with things hanging off my head, so the bun will be in the “normal” place at the back, not on top. A forum dedicated to discussing long hair pointed me towards Ketylo sticks and Etsy – and my sparkly-senses went wild. Unfortunately, all the interesting stuff is in America and Canada and UK VAT (20%) and RM’s handling fee (£8) makes importing such things rather expensive. I nearly spent $100 until I realised that the additional costs of bringing it into the country by post would cost rather a lot – nearly half the cost of the items! I decided to make something. My first point of call was the Bead Shop in Nottingham’s city centre and I spent far too much buying Swarovski beads and sterling silver findings. If I’m going to make silver jewellery, I don’t want it to turn copper in 18 months time! 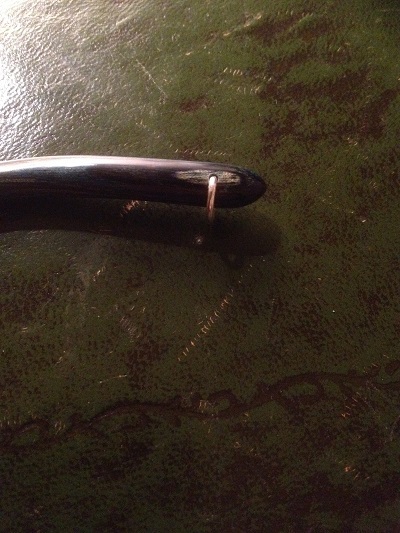 I didn’t have a design in mind, as I was making it up as I went along, but I did know I wanted it in silver and I did know I wanted to thread beads onto eyepins (small metal bar which you can loop at both ends). 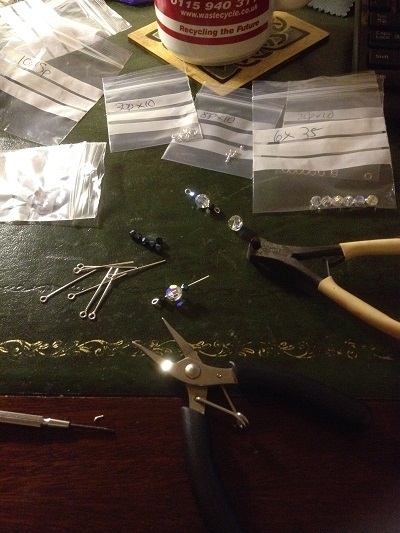 So I sat down and began threading beads onto pins and building a chain of beaded pins and jump rings. 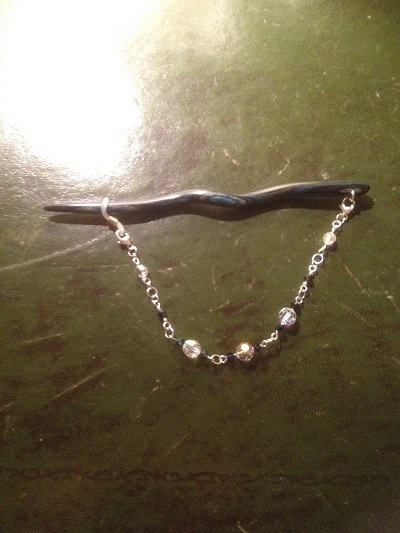 Finally, the accessorised hairsticks I’d nearly bought were clipped to a ring at the not-pointy-end of the stick then clipped onto the other end with a miniature hair grip. I thought that was rather large, so have improvised with the small rubber band and ring set-up you generally tend to see at the ends of spectacle chains. Slightly more discreet, but I could only get white. Ideally I’d like black, but that was all I could get at short notice. So each end of my chain has a trigger clasp, the rubber loop allows one end to hang from the stick and I’ve drilled a small hole through the stick and attached a larger jump ring which allows the other end to be clipped on securely. Actual working time was probably 3-4 hours, mainly because I had to learn how to bend the eyepins to form a new loop, but partially because the jump rings kept popping open. I reckon I could do it again in 90 mins or less, assuming I had all the parts necessary. It would be nice to solder the jump rings closed, but I don’t have access to the tools for that. 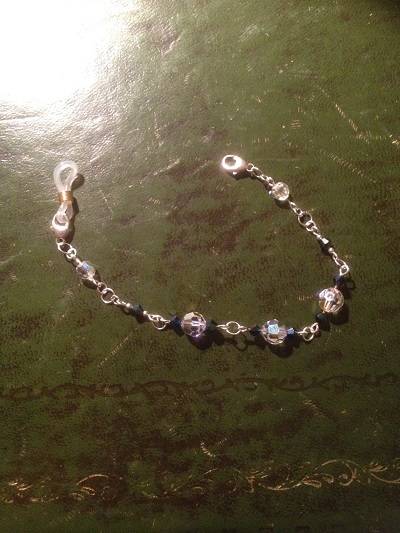 This entry was posted in Jewellery and sparkly things, Quick project on October 16, 2013 by mellchie. It’s been a while since I’ve worked on the physical form of my Alethiometer table, although I’ve thought about it a lot. So far I’ve started to learn to program an arduino and have a working piece of code for selecting and illuminating the LEDs. I’m starting to appreciate the size and complexity of the challengwe ahead, an inevitable web of files and strings all working to generate a simple visual output. The next step was to get hold of a sheet of ply and start wiring up the LEDs and motors, whilst planning to laser cut some veneer for the central compass design. This entry was posted in Uncategorized on July 4, 2013 by mellchie. A quick hack… Tron bike! …Okay, so not exactly a Tron Bike. But I had a couple of lengths of EL wire to play with and a poor imagination. After a lengthy trawl on Google I decided the easiest way to utilise it would be to outline my bicycle. 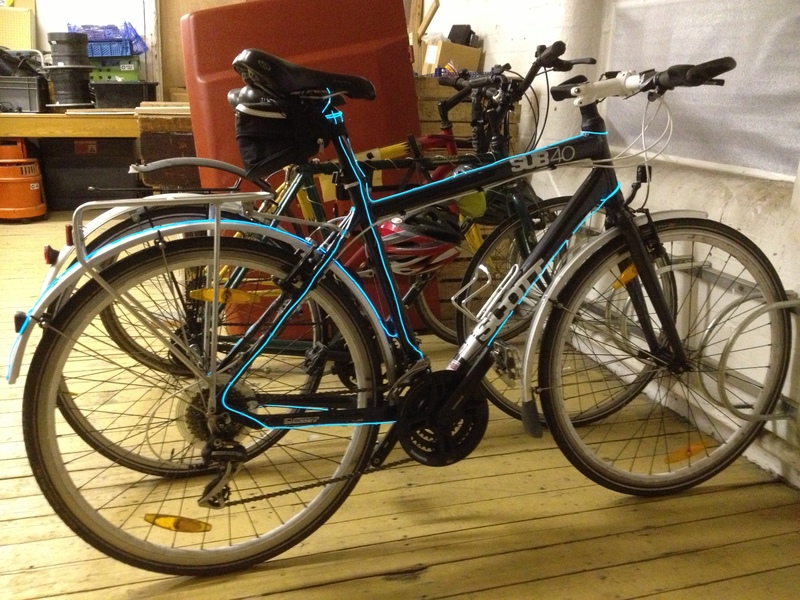 My partner’s bike was wrapped in EL wire which, whilst glowing like the Blackpool illuminations, didn’t look particularly special in my opinion (sorry, dear). I played about with the length of wire I had and some tape and decided that outlining the frame had a nicer effect than spiralling around it. The next task involved deciding on a way to attach the wire to the bike. Some “caterpillar” grips had been left with the wire – rubber grips with a sticky backing, into which the EL wire clipped. Unfortunately, despite carefully cleaning the frame with meths before applying the caterpillars they soon detached. I was looking for a method of attaching the EL wire without cable ties, which were messy. I didn’t want anything permanent, or that might damage the paintwork too much should I need to remove the wire for any reason. 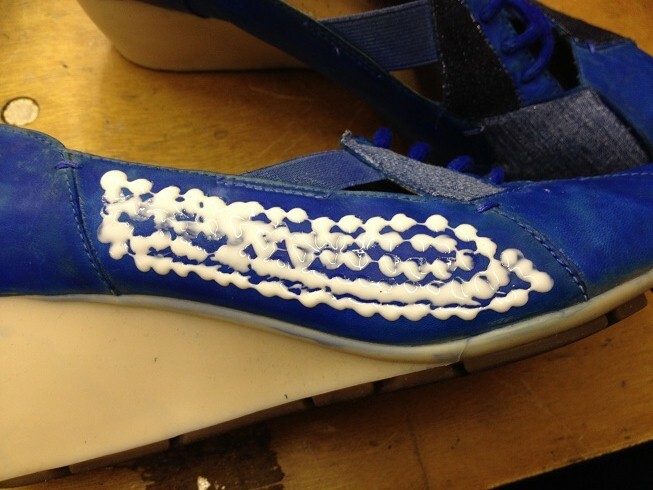 I settled on Sugru, which claimed to stick to almost anything. It did for a time, but whether I was too stingy with how much I applied or whether the paint was inappropriate as a surface I don’t know, but a good third of the blobs of Sugru soon either detached or broke up. I then had a stroke of genius. I have no idea where it came from; an overheard conversation? Something I’d read on the internet? But I decided to try hot glue. Now, the internet suggests that EL wire doesn’t respond well to heat and I can quite happily believe the paint or plastic would be easily denatured by hot or prolonged exposure. A brief test on the end of the wire indicated however that the short exposure to the molten resin didn’t appear to have an effect on its ability to glow, or the colour emitted. Given the metal frame would act as a heat sink I was confident that the wire would not be damaged during application. Two weeks later the stuff still sticks and the EL wire still glows, so I appear to have guessed correctly. Meanwhile, I was trying to work out the optimal way of powering the EL wire. The obvious choice were Li-ion batteries, which are reasonably compact and relatively light (in comparison to a lead acid), but I didn’t know which transformer I had or how much power it would draw. My dad provided the answer; on a rare visit home to my parents we sat down with a multimeter, the EL wire and transformer and an assortment of batteries including some 1.2V AA, a handful of rechargeable and single-use 9V and an old 12V motorcycle battery. We used the mutimeter to measure the voltage provided by the batteries and applied them to the transformer. Obviously the motorcycle battery worked well. To be honest we didn’t even try the AA batteries, as we didn’t have any way of tying a number together. The 9V batteries provided some interesting results, though. The brand-new single use batteries powered the wire nicely, whilst the rechargeable batteries failed to make even a faint glow. Measuring the voltage of the batteries showed around a 0.3V difference between the two groups; the single-use batteries provided around 9.6V, whilst the rechargeables varied between 9.30 – 9.35V, indicating that the wire could be powered successfully from a minimum of 9.6V supply. The next task was to work out how much current the wire was drawing, and whether this varied between the 1m and 3m lengths of wire I had to hand. In practice there was very little difference; both drew around 0.2A. 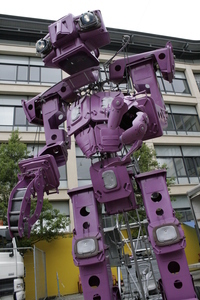 Coupled with the knowledge that the wire can be supplied by a 9.6V battery, we determined that eight AA batteries would be sufficient to power the wire for, theoretically, anywhere near 10 hours (assuming 2.9Ah batteries were used, allowing for any resistance or wasted energy – the transformers squeal quite nicely at a frequency above 12,000Hz, as my dad was blissfully unaware when I mentioned it). A quick trawl on the internet identified some 2.9Ah AA batteries at around £5 for 4, so I purchased two packs along with a couple of battery holders with built-in switches (about £1 each). I removed one of the switches, wired the holders in series and finished by unceremoniously taping the two together. A terminal block was attached to the two dangling power wires and I inserted the first transformer, switching the power to *on*. Result! As expected, the EL wire illuminated with an eerie glow. I then wondered if two transformers could be run off the same battery pack and added a second one in parallel to the first by screwing an additional transformer into the terminal block. THis gave me an additional glowing wire. Since then, I’ve discovered that you can buy splitters which attach between the wire and the transformer, allowing multiple wires to be powered by one transformer instead of the multiple-transformer setup I have. I may eventually get around to purchasing in order to reduce the number of transformers I’m using. But for the meantime, the entire pack – batteries, transformers and dodgy wiring – fits nicely into my saddle bag with room for a puncture repair kit, my handy set of Allen keys and a couple of nitrile gloves. And that’s it! The batteries remove easily from the holder and pop into a normal charger and so far I would guess I’ve had around 4hrs use without a charge. I’d like to get my hands on a couple more battery packs, or find a more compact, lighter way of powering the wire (even for a short period of time) so as to completely outline the bike in blue, as I’d like attach two power packs and transformers to the wheel hubs in order to illuminate the rims. It has been done by others before me (google it!) and I’ll most likely lose interest and move onto another project before I get around to doing it (maybe I’ll go back to my Alethiometer table?!). In the meantime it’s fun to think about. Having been through Google images I also like the idea of integrating EL wire into clothing, such as on a motorcycle jacket or corset (something I previously thought about doing with Lilypad stuff and some conductive thread) and maybe if I had the time, money and a slightly less distracted mind I’d do all of this. But for now, I’m satisfied with my Tron Bike! 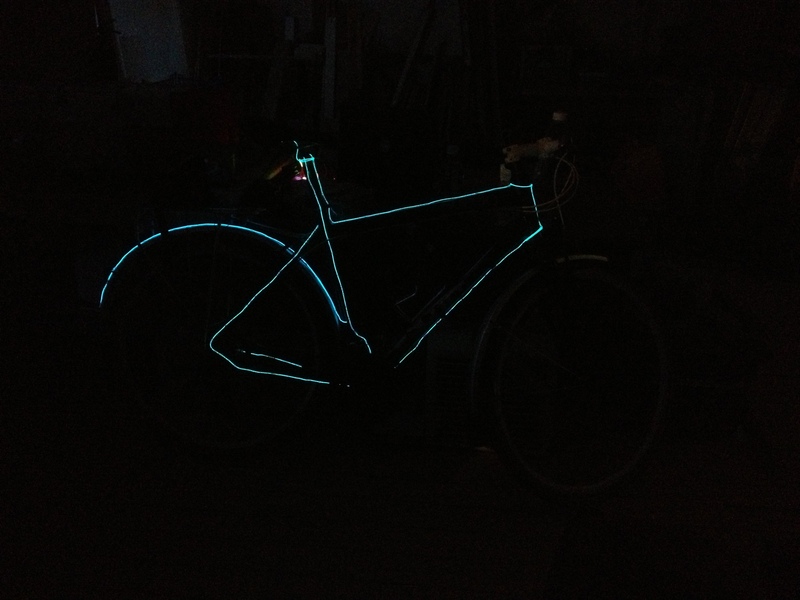 This entry was posted in Bicycle, EL Wire, Quick project on July 1, 2013 by mellchie. As it turns out, there was more at hand than a single degree error, now rectified. Thankfully, the method I mentioned in my last post was a success! However, I am now a couple of segments short. The laser power was now fluctuating to the point it could no longer penetrate the perspex I was using. Very strange. Marginally changing the power settings had no effect (I was using settings recommended to me by the laser’s owner). 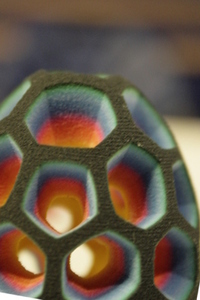 A test cut in my material of a small, 8mm diameter circle was a success. I set up the laser to cut a single segment. The image was perfectly transcribed into the plastic; but not through the plastic. Looking at the cut it became apparent that the laser power was decreasing with the length of the cut; the start of the cut penetrated the 3mm perspex with no problems, but after 30mm or so the beam no longer penetrated. I’m not sure how deep the cut was at the end, but I couldn’t press the shape out nor free it with a Stanley knife. After a couple of weeks, other users’ experiences of the laser came to light and the alignment issue seems to have reappeared in addition to the power issues. As I type, new parts (a tube and mirrors) are being shipped from abroad in an attempt to fix the issues. Lets hope so, as I may be struggling to find another laser cutter if not! 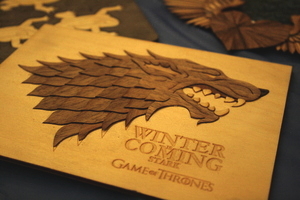 This entry was posted in Compass table, Laser cutting, Laser engraving on April 1, 2013 by mellchie.